My heart was broken my first night in Bangkok by a tiny cat that crawled out from under a bush and laid down on my foot as I waited to cross a street. I don’t know why it chose me, I mean how could it have possibly known the giant space in my heart that’s reserved for animals? At first, I was a little put off by this rough looking and possibly flea and disease ridden stray cat rubbing itself all over my almost bare foot. But I was overcome with love and compassion for the poor little thing and I leaned down and petted it, and it purred, and I wanted to bring it home with me. 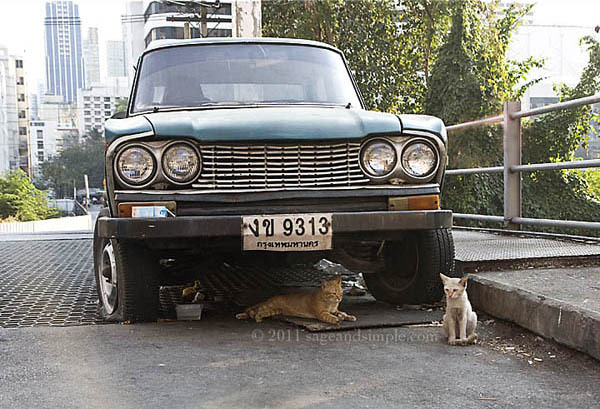 These cats live under that car. They had cardboard to sleep on and someone had given them water, but it didn’t look like they’d been fed. 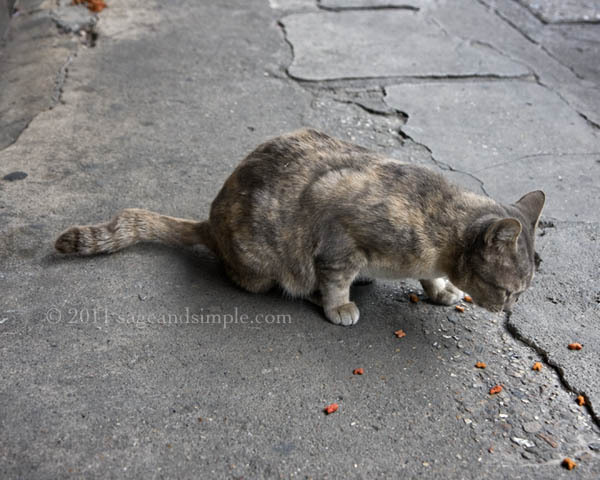 A few days into the trip, I bought cat food and carried it in my camera bag so I could feed stray cats as I met them. I know some people say this just contributes to the problem, but I couldn’t turn my back on them. Oh, my. That little skinny cat in the first photo especially touches the heart.